Chesil has calmed down a bit and the water is starting to clear, but the temperatures are still very low and showing no signs of increasing. There have not been too many people on the beach, and most of those have been going home having just had some Rockling and Pout. Some people have been a bit more succusful. 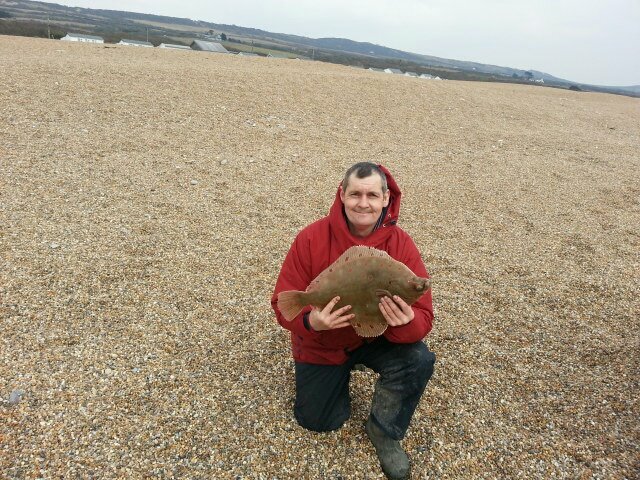 Chris Powell managed a lovely 3lb 9oz Plaice from West Bexington. He was fishing at range with a wishbone rig and size 1 hooks. Bait was Ragworm tipped with Mackerel. Portland Harbour: Surf running on most of the beaches in the harbour with the exception of Castletown. Weymouth Bay: large surf running for over 100m with a lot of colour in the water. Chesil Beach forecast: You will pick up Dogfish, Pout and small Whiting through out the day with the odd Dab and Rockling. It is not impossible that you will get a Plaice but conditions are not great for them. Portland: Coloured water and a large swell make for poor fishing on the island, with the exception of Bull Huss. For the best chance of a Huss you will want to target them after dark using fish baits. Fishing at dusk today should see some Pollock. Tides are better on Sunday as high water falls just before dusk. Lures work best for Pollock. Portland Harbour: With surf running on most of the beaches in the harbour it could offer a chance of a Bass. There is not too much weed around at the moment so fishing will not be too hard. Weymouth Bay: Preston Beach is my number one choice this weekend for the chance of a Bass. In truth it is too cold for them but you do get shoals of fish all year round that sometimes come inshore when the conditions are right.